Piclopedia's initiating sponsor is Terra Segura International. Please visit them at www.terrasegura.org. 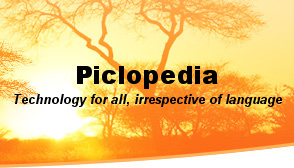 Please go to www.piclopedia.ning.com to read up on how the project is being organized and to join. The eGranary Digital Library provides millions of digital educational resources to institutions lacking adequate Internet access. Sandec's activities centre on problems of sustainable development in economically less developed countries. Its mandate is to assist in developing appropriate and sustainable water and sanitation concepts and technologies adapted to the different physical and socio-economic conditions prevailing in developing countries. "Mesh topology also offered much larger area coverage, while the “self healing” nature of Mesh routing, proved to be essential in places where electricity supply is very erratic at best."